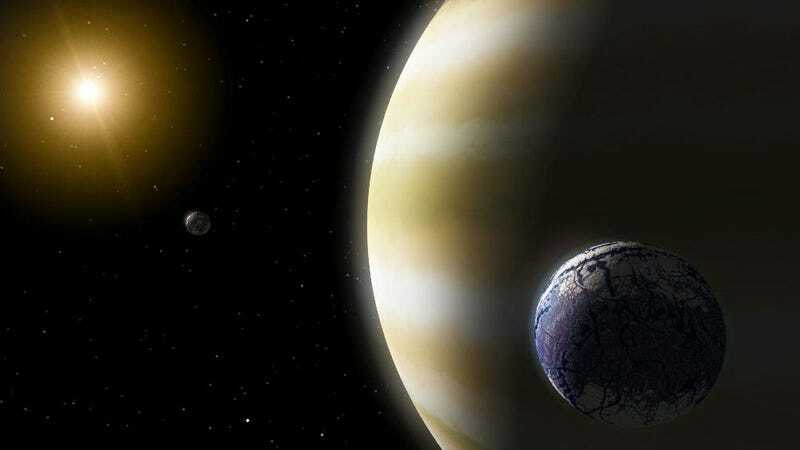 After mulling over old Kepler data, the researchers think they’ve found evidence of the telescope spotting a Jupiter-sized planet and a Neptune-sized moon passing in front of a star, called Kepler-1625. When a planet and/or moon passes in front of a planet, or transits, it causes a dip in light, which is why the team here thinks they’re onto something. They plan to confirm their finding using the much more powerful Hubble Telescope. But if past flubs prove anything, it’s that spotting exomoons is trickier than it sounds. But is it worth hunting for exomoons for any particular reasons, other than the fact that it’d be cool to find them? “Because moons are numerous in our solar system, they are likely very common in other planetary systems. Additional observation proposed with Hubble may be able to confirm this exomoon,” Guinan said. “The discovery of exomoons is very important since some of these moons could provide additional habitats (niches) for life.” In our own solar system, two moons—Enceladus and Europa—have already proven themselves worthy prospects for supporting liquid water oceans and even life. Hopefully we’ve found an exomoon this time. Who doesn’t want to discover an alien moon? If we strike out again, big league telescopes like the James Webb Telescope will do the trick one day—fingers crossed.